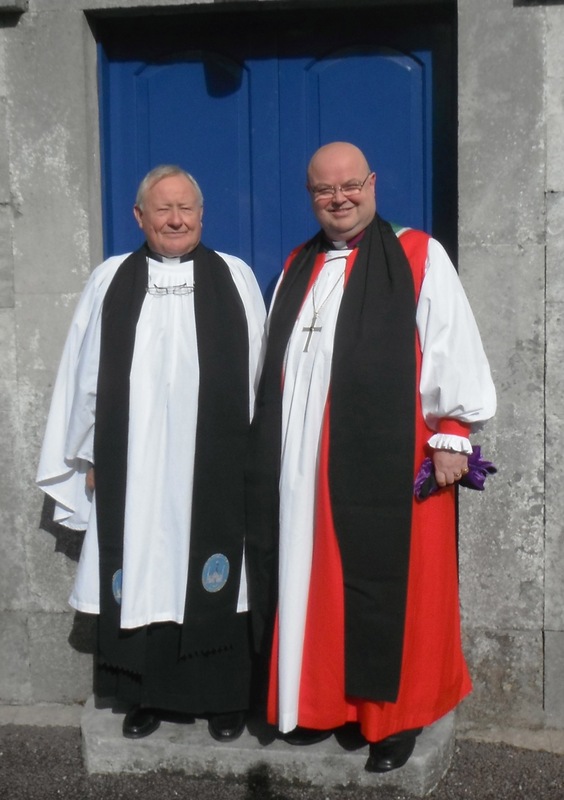 The Reverend Canon Tom Sherlock was presented by the Trustees of Kingston College to the Bishop of Cork, Cloyne and Ross, the Right Reverend Dr Paul Colton, on Wednesday 2nd October and was installed as Chaplain of Kingston College. The new chaplain then undertook his first duty as Chaplain by conducting Morning Prayer for the residents of the College who were joined for the occasion by guests from the wider community and local churches. Afterwards the trustees entertained everyone to lunch at the Firgrove Hotel, Mitchelstown. Canon Tom Sherlock is photographed following his installation as Chaplain of Kingston College with the Bishop of Cork, Cloyne and Ross. Kingston College was built and endowed in 1761 by James, Fourth Lord Baron Kingston. The College (i.e. ‘community’ – not an educational establishment) consists of thirty small terraced houses grouped around a large square, with a chapel in the centre. The setting is very attractive and the buildings are fine examples of Georgian architecture. The foundation was intended originally for former tenants of Lord Kingston’s estate, which is long since gone. The houses are now occupied mostly by retired, people from all walks of life and from all parts of Ireland and beyond. The houses are not identical, but each is a separate, self-contained unit, with garden and out-offices, and the residents live completely independently, while still enjoying the benefits of being part of a community. As well as a chapel, there is a community room, which is used from time to time for various functions. This entry was posted in Bishop, Chaplaincies, Church Services, Diocese, Installations. Bookmark the permalink.